I am an experimental cook, I follow recipes, but I also use my own knowledge and intuition to tweak things. The problem with this is sometimes I don’t remember how I made something, and then I cannot recreate it. I need to take notes I guess. So a year or two ago I made a really nice braised pork loin dish with an apple gravy, and I forgot what all I did with it and have been trying to recapture the flavors. This this dish, I think I might have succeeded. I bought the new Feast of Ice and Fire cookbook from the A Song of Ice and Fire book series (Game of Thrones on HBO). In addition to all the very nice photography from the blog, which I had seen before, the cookbook is neat because it includes both a traditional (medieval) recipe, and a modern version. One of the recipes is a pork and apple pie, this piqued my interest both because of my desire to reclaim my lost pork and apple success, and the fact that I’ve also been interested in savory pies lately. 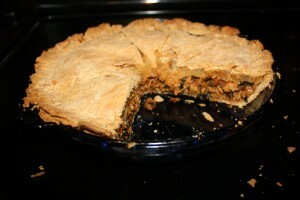 The recipe essentially called for mixing onions, pulled pork, ritz crackers, cheddar cheese, various seasonings, and apples in a covered pie. I took inspiration from this, but didn’t follow the recipe. I used my own seasonings, and cut both the ritz crackers and the cheese as unnecessary calories, I wanted to focus on the pork and apples. So I made pulled pork, and how I do this is I take a pork loin, rub it with a BBQ rub (usually bought at the store), marinate it in a zip top bag in white wine and vinegar and salt for a day, then put it in the crock pot (marinade with it) to braise for 8 hours until it is falling apart. This can be, and was in my case, done ahead of time. When I wanted to make the pie first I made the filling. I took a very large sweet yellow onion and sauted it until carmelized, then I added the torn up pork I had made previously, maybe a quarter cup of homemade pear butter, enough of a sweet store bought BBQ sauce (Sweet Baby Ray’s in my case) to get the consistency I wanted, which was pretty wet, like a good pulled pork sandwich. I also added some finely chopped kale from my garden which I add to almost all dishes in the summer month as a nutrition boost. Don’t be afraid of leafy greens, kale, spinach, or beet greens can be added to almost anything. Then I made my pie crust, which was a relatively standard pastry pie crust, a few minor tweaks. What you normally do to make your crust flaky is you take cold butter, dice it, and cut it in the flour (with paprika and salt) so the flour forms crumbles. You definitely want to add cold fat to your flour, whatever kind of fat you use, you can do this in a food processor (gently). Basically you want it to have a crumbly texture, then you can add the water and the eggs and other stuff and make it a dough, don’t overwork it, just let it come together. Once you have your dough, roll it out pretty thin, about a quarter inch, drape it over your pie pan, cut off the excess, reroll said excess. Now you can ladle your pork mixture into the pie. Then take two granny smith (or other) apples, peel, core, and slice then. I sliced very thin using my v-slicer (another tool every kitchen should have). Put a layer of apple slices on the pork, sprinkle with brown sugar, put another layer, sprinkle with brown sugar, rinse repeat until you’re out of apples. Now take your remnant pie crust that you rerolled out, drape it over the pie pan, remove the excess and crimp the edges of the top and bottom crust pieces with your fingers or a fork, and cut 4 vent holes in the top. Your pie is assembled. Bake it for between 45 minutes and 1 hour at 375 degrees. Your pie will be delicious. Previous PostHow to cook with Nutmeg, and have it taste good.